The inaugural Trash Dash 5K at Harry S. Moss Park in Dallas was moved to May 12 due to trail conditions. Photos courtesy of organizers. Bicyclists and trail runners at Harry S. Moss Park in Dallas know the 284-acre wooded hideaway is an urban treasure. Now the park’s loyal fans and an army of eco-friendly high school students are organizing an event aimed at keeping the wild space from disappearing under a mountain of trash. The first annual Harry S. Moss Trash Dash 5K, Trail Run and Eco Fair trots off at 9 a.m. May 12, in the park at 7601 Greenville Avenue. 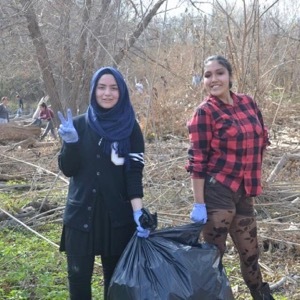 Though students from Hillcrest and Emmett J. Conrad high schools have been staging cleanup events there for some time, this is the first community event they have sponsored through their respective Environmental League chapters, a local nonprofit started by Dallasite and park fan James Lord. “I like to run, and two years ago I started running on Harry Moss trail,” Lord said. He loves how the trail skirts White Rock Creek and covers twists and turns, dips and hills, making a square mile bordered by Greenville Avenue, Walnut Hill and Royal Lane. Proceeds from the Trash Dash will benefit the schools’ Environmental League chapters and National Academy Foundation specialty academies. Harry S. Moss is one of Dallas’ least-known natural areas, according to its supporters. The full park was established in 1972, but the secluded, heavily wooded area got a boost in 2010 when work began on a multipurpose hiking and biking trail and seven connecting loops. The Dallas Off Road Bicycle Association manages the six-mile trail system in partnership with the city of Dallas. “It’s such a beautiful place, but incredibly littered,” Lord said. He began bringing bags with him to pick up trash along the trail. Despite the efforts of Lord and others who use the trail, the litter kept reappearing. The inaugural Trash Dash 5K, and the campus Environmental League chapters, are projects close to the heart of Lord, a self-described “serial entrepreneur” who has kicked off 15 businesses, mostly dealing with fitness and athletic training systems. Last spring, Lord joined with Stephanie Jackson, a Conrad teaching assistant; and an attorney friend to come up with a plan for school-based organizations dedicated to good environmental practices. They began with Conrad and Hillcrest high schools, and the Environmental League was born. Members of the Environmental League picking up trash at Harry Moss Park. 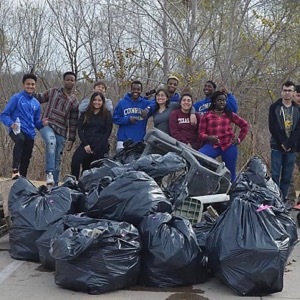 The Environmental League chapter members at Conrad and Hillcrest high schools have collected more than 7,500 gallons of trash in Harry Moss Park since then. Environmental League goals are to increase students’ nature appreciation; help build critical thinking, creative and communications skills; and demonstrate that individuals and groups can make a difference. The number of school Environmental League chapters has grown. This spring, Jackson said, chapters have been added at Dallas ISD’s Sunset, Pinkston, and Townview high schools, Griener Middle School, and even Plano’s West High School. Organizers hope to get at least 300 participants out to the inaugural Trash Dash 5K. “It’s adventuresome, we will cross two creeks, the trails go all over the place,” Lord said. Participants in the Trash Dash 5K may run or walk. The format is an Exercise Walk, where participants come across 10 manned checkpoints at which they must perform an easy exercise such as jumping jacks or air squats before continuing. Or, competitive runners can trade off pieces of litter at the checkpoints and skip the exercises. The race is chip-timed. The Eco Fair, set up at the organizing point for the Trash Dash, will include commercial displays by green-friendly businesses and organizations. One project is as simple as five trash bags filled with 365 plastic water bottles. “If you drink one bottle of water a day, this is how much you’re putting into the landfill for a year,” Jackson said. Another project is aimed at raising awareness of the mess created by single-use plastic straws and urging fair-goers to sign a petition to end their use by restaurants and fast-food outlets. After the race, awards will be handed out and participants can enjoy food, fun and education as the student members of the Environmental League show off their planet-friendly projects. About: 5K trail run through wooded area of the DORBA-managed Harry Moss Park. Along the way, at 10-plus manned checkpoints, participants must do a simple exercise before proceeding or drop a piece of litter off. When: May 12, 9 a.m.
Where: The fair and entrance to the race will be the large field on the south side of the Northeast (Fair Oaks) Transfer Station at 7677 Fair Oaks Ave. The area will be open for all to enjoy the Eco Fair booths and project displays until 1 p.m. Award announcements will begin at 10:30 a.m. No strollers or pets are allowed in the race itself. Cost: $35, includes an event T-shirt, runner’s bib, chip-timer band and more. Swag bag pickup for registered runners starts at 8 a.m.
Shirley Jinkins is an Arlington-based journalist and writer who has reported on K-12 education, municipal issues, country music, environmental and age-friendly livable communities during her 35-year career with the Fort Worth Star-Telegram. She has written about urban food deserts for Texas Christian University's TCU Magazine and energy-saving commercial lighting options for the Fort Worth Business Press. Contact her at shirley.jinkins@gmail.com.